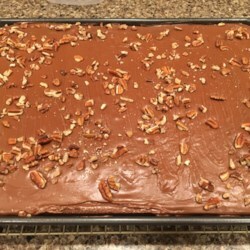 "This chocolate sheet cake is made with coffee and sour cream. Included is a recipe for frosting which should be spread on the cake while it is still very warm. It is VERY rich. My daughter encouraged me to submit the recipe on-line. Hope you like it as much as we do."